When does a runabout become an upmarket recreational vehicle? When it leaves America and comes to Europe. 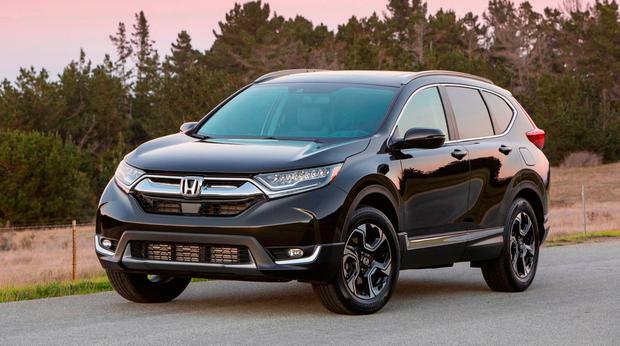 Honda launched its CR-V in America as a 'Comfortable Runabout Vehicle' but when it arrived in Europe reviewers indicated the CR-V stood for 'Compact Recreational Vehicle' which was later republished by Honda as the company did not quibble with the new designation. The latter sounds more posh, and suits the more snobbish buyers this side of the Atlantic who would like to think that the expensive crossover/SUV they had just bought was more than a lowly runabout. The latest offering which has just gone on sale here has moved more upmarket, very sophisticated, and this is represented in the pricing which runs from €33,500 for a five-seater to over €45,300 for a seven-seater. This is the first time there is the option of two extra seats and Honda believes that many buyers will opt for the extra passenger capacity. Adding two extra seats is a trend that is developing in the medium and large SUV market, helped no doubt by purchasing through PCP where a few extra euro a month gets you into a top-of-the-range vehicle. As PCP purchases are rolled over into the second-hand market, there is a good choice of well kitted-out models now available to choose from. Externally, the new CR-V has much the same dimensions as previous models but it does look smarter with sharper lines giving it a strong stance. It now has a longer wheelbase and this means more room inside which allows for the option of the extra seats. Initially there is a 1.5-litre turbo-petrol 173bhp engine putting out 220NM of torque but the power to weight ratio may not make for top fuel figures with this power plant if hard driving is involved. There is no diesel on offer but if economy is a priority a hybrid version will be available next year with new advanced engineering offering up to 5.3L/100km (53.3mpg) and emissions of 120g/km. The claimed figures for the all-wheel-drive are 5.5L/100km (51.4mpg) with emissions running at 126g/km which is impressive for a more useful and safer workhorse. The hybrid features an all new twin motor Intelligent Multi Mode Drive (iMMD) power train using an electric motor, a two-litre engine and a separate electric motor generator which can give a total power output of 181bhp and 315 NM of torque. The system uses a single fixed gear ratio in place of a conventional gearbox which shuffles between its three driving modes, EV Drive, Hybrid Drive and Engine Drive. The EV and hybrid driving modes are tuned for low speed and around town driving and the petrol engine cuts in to power the wheels for high-speed driving on motorways. It also delivers power to the electric motor and recharges the battery pack. The prices here are expected to be close to the €40,000 mark as the new technology does not come cheap, but hybrid power is definitely a money saver at the petrol pumps and may be a good option in lieu of a diesel offering. With loads of space and a good level of kit on board the CR-V makes for comfortable family transport. It has a premium feel with good seat adjustment and a high level of active safety and driver assistance at all trim levels.